Do you find that you’re always in need of an easy weeknight side dish? We’ve got you covered with these Parmesan Peas. Whether you need something to serve alongside chicken breasts or just need to make sure the kids are eating enough vegetables, these Parmesan Peas are quick and better yet, easy to make. Heat the Easy Reach Toaster Oven to 350 degrees. Then add oil and garlic to the toaster oven baking pan and bake for about 5 minutes or until the garlic is lightly browned. After the garlic is browned, add frozen peas that have been thawed to the pan. Bake the peas for an additional 10-12 minutes until they are heated through. 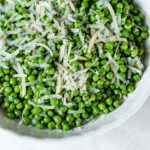 Transfer the peas into a serving bowl and sprinkle with your favorite parmesan cheese and you’re ready to serve. It’s that easy. The next time you’re in desperate need of a side dish, remember these cheesy peas are ready in under 15 minutes. Heat the toaster oven to 350°F. In toaster oven baking pan, add oil and garlic. Bake for 5 minutes or until garlic is lightly browned. Add peas to the pan. Bake an additional 8 to 10 minutes or until peas are heated. Sprinkle with cheese and pepper before serving. Spring has sprung and we’ve started to lighten – and brighten – things up in the kitchen. We’re swapping winter’s hearty soups and stews for fresh salads. This spring green salad with lemon vinaigrette is the perfect dish to help you dive into your new seasonal menu. 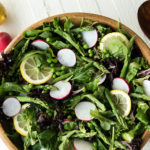 This simple salad is packed with some of our favorite springtime ingredients – asparagus, radish, and spring peas. Start with your favorite greens, then add blanched asparagus (blanching them will make the spears easier to eat and brighten their color), blanched peas, beautiful red radishes, and some lemon slices for color. The Hamilton Beach® Professional 14-Cup Dicing Food Processor was used to expertly slice the radishes. This food processor comes equipped with an adjustable slicing blade. With 14 thickness settings, the food processor makes it easy to achieve everything from paper thin radish to thick pepperoni slices in a matter of seconds. We drizzled this fresh salad with our blender-made lemon vinaigrette. The Hamilton Beach® single-serve blender is great for making quick dressings and marinades. 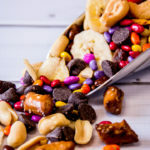 Bottled dressings can be expensive and making your own lets you save a little money and control the ingredients (especially the salt and sugar). Use yours to blend fresh lemon juice, olive oil, shallot, honey, salt & pepper. The citrus dressing is the perfect accompaniment to this spring salad. Serve this spring green salad by itself for a light lunch or serve it alongside grilled chicken or fish for a seasonal supper. In a medium saucepan over high, heat 4 cups of water to a boil. Quickly blanch asparagus spears and fresh peas, 30 seconds to 1 minute. Immediately, place in ice water to chill. Drain and set aside. If using frozen peas, defrost in microwave. Divide greens between 8 salad plates. Arrange asparagus spears, peas and sliced radishes on top of greens. Add one slice lemon to each plate. In a single-serve blender, combine olive oil, lemon juice, shallot, honey, salt and black pepper. Blend until smooth. 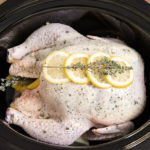 Slow cooker lemon thyme chicken is the perfect springtime recipe to have on hand. Make it to serve for dinner on the patio as the weather warms or for your Sunday meal prep. You could serve it for dinner on Sunday and save leftovers to toss into salads, tacos, or rice bowls throughout the week. Winner winner chicken dinner, indeed. Slow cooker lemon thyme chicken puts the spring in spring chicken. Garnished with extra lemon slices and sprigs of fresh thyme, this beautiful bird will surely fly off the table. Serve with a simple spring salad or shred leftovers for meals throughout the week. No need to pick up a rotisserie chicken at the store when you can make your own whole chicken at home in your slow cooker.